The Perfect Garden Edging Solution! Let’s face it, when it comes to the edging in the garden, we want it to look perfect and stay that way. There are many types and styles to choose from but most of them don’t last or keep that perfect look. It doesn’t matter if that edge is separating a garden bed from lawn, pavers or some sort of rock bed or path, you want it to keep its looks and not need replacing or updating every year. With the LinkEdge garden edging system, you can keep that perfect look year after year! When it comes to Garden Edging Ideas, none are as long-lasting or as flexible as LinkEdge. Cement cracks, wood rots, plastic fades and cracks, steel rusts, rocks move and rubber just doesn’t last or keep its shape. But LinkEdge isn’t like any of those! Its aluminium design lasts the test of time, no matter the weather conditions! And its flexibility allows you to create a straight or curved edge! While LinkEdge is metal, it’s not steel or copper but aluminium garden edging. Aluminium doesn’t crack, rot, fade or rust. This is why we chose it for our LinkEdge system. Additionally, this allows a flexibility to the lengths which means you can have curved or straight lines and it can be powder coated in a variety of colours. In the instances where you have a harder surface to work with, the heavy-duty option is available. There are extra anchor points in the heavy-duty range, allowing you to use our spikes and Ramset pins. This is used primarily in higher compaction and high traffic areas like a driveway. The heavy duty range is available in three-metre lengths only with the choice of 50mm, 75mm and 100mm heights. Need a lower profile garden edging? We now have a low profile edging range that is only 16mm or 20mm in height. This is perfect for use with permeable paving and tiling or other low profile aggregates! Want to put an edge around a tree or a special section? Why not use the square or circle kits! These are made for exactly that. To create perfectly symmetrical edges that are hard to replicate with other edging products. The Square KIt is available in 500mm or 1000m sides and the Circle Kit is available in 630mm or 950mm diameters. We also have a range of edging accessories available. Things like corner connectors, extra spikes, fishplate connectors and spike guides if you need them. Thanks to its unique design, the LinkEdge system looks great in any garden or path. You can select colours to make your edging invisible or add some extra colour if you desire. LinkEdge could be in your garden! We’re sure that once you do, you will agree that LinkEdge is the Perfect Garden Edging Solution! When it comes to having a nice looking garden you have to have good Garden Edging in place. Not only does neat Garden Edging help define the different areas of your garden by showing a dividing line, but it can help keep those areas separate from each other. You don’t want your lawn encroaching on your flowerbed or veggie patch and you want to keep the mulch or gravel where you put it. But what is the right Garden Edging type to use? What edging material will do all that? Over time, plastic garden edging breaks down and will eventually need to be replaced. Plastic garden edging may also be damaged by an errant wheelbarrow or lawn mower tracking over the top of it. You will probably get only one year, maybe two if you’re lucky, out of it before you’re replacing it. You have a few choices here like railway sleepers or pine logs. While these can be treated to survive in the elements, they will still rot, crack and splinter and eventually need to be replaced. Plus, you can’t do curves unless you purchase specially made pieces. Depending on the size of the sleepers or logs, you will need at least two people or more for installation and a trailer to transport it home. Concrete garden edging can be more permanent than plastic or wood, but unfortunately, it can still crack and fade. Again, running over it with the lawn mower can result in either the concrete garden edging and/or your lawn mower being damaged if you’re not careful. Concrete garden edging is often bulky and always heavy, so you may need two people for installation. Over time, pavers change colour or fade so if you need to replace one, the new one will look out of place amongst the old faded ones. Quite often, people will cement the pavers or bricks into place. This makes it challenging to replace any of them if they crack. If the cracking occurs in the cement underneath as well, then that broken section can dislodge or sink. In the long run, cement garden edging, be it straight cement, pavers or bricks, can become a problem and be really hard to replace. Rocks can give a nice rustic appearance to your garden but often require cementing in place so that they don’t move. Certain types of rocks can be fragile too. Slate or sandstone can easily chip, break or fall apart totally. Once again, a careless movement with the lawn mower could destroy that neat clean look you were after, not to mention the lawnmower blades or your legs if chips of stone start to fly. While a more lasting product, recycled rubber garden edging can still break down in our harsh Australian climate and will eventually need to be replaced. Plus the crisp and clear lines will be harder to achieve as rubber isn’t known for clean straight lines that last. Metal garden edging has a nice clean look with pleasing straight lines throughout your Garden. Crisp and clear divisions between your gardens sections can be easily attained but the type of metal can cause problems once again. Many metals like steel can rust, develop sharp edges or simply discolour over time. There are many different types of metal that can be used and aluminium is one of the best materials for garden edging as it doesn’t rust, discolour or get sharp edges. Read more on Metal Garden Edging, including information about installation and what products are available. Unlike all the other product types mentioned, aluminium is made to last! It doesn’t crack, fade, corrode, break down or develop sharp edges if designed right. If you run over this with the lawn mower, all you will see is sparks, not cracks, chips or damaged mower blades! Plus it can be flexible so if you want a curve or two, it can be easily achieved. Read more on Aluminium Garden Edging and the Link Edge system. We think our Link Edge Garden Edging System is the ultimate in Garden Edging. Not only is it made from aluminium because of its longevity but it also is flexible so it can be used in every situation you could possibly want to use it in. Link Edge is available in different lengths, heights, colours, strengths and shapes. Have an acidic soil or want to put it on a driveway or stone? Then use the heavy duty edging products, designed just for such situations. You can bend Linkedge for curves or use a right-angled corner piece for precision corners. You can have a high profile using spike guides to help maintain rigidity or a lower profile to hide the edging if you desire. It can be used on hard or soft surfaces and even on slopes too! Just tell us what type of surface and we will advise you on the best way to secure it. The upper edge is curved so there are no sharp edges. That’s great for the safety of the kids when they are playing outside! See the Aluminium article mentioned above for more information or go to the Products page to see what we have available. Our Ideas page has lots of pictures where you can see how others have used Link Edge. It might give you some inspiration for your own garden edging plans! Call us now on 1800 454 657 to discuss your Garden Edging Ideas. With the arrival of the warmer weather, many people are heading into the garden to clean up those winter weeds and do general tidy-ups. This can include replacing old edging systems or planting new garden beds that require a new aluminium garden edging to keep it all neat and orderly. If you need to create or replace the garden edging system, then you have some options to consider. These including garden edging using plastic, wood, cement, rock or metal. In a previous article on metal garden edging we discussed the various edging options and their advantages and disadvantages. In our experience, an Aluminum Garden Edging Strip is the best choice. The major advantages of Aluminum Garden Edging are that it doesn’t rust, crack, fade, develop sharp edges or need painting. Aluminium edging is also lightweight so easily carried to the worksite. Further aluminium is able to be more easily shaped into curves. This is why aluminium is our choice when it came to manufacturing our edging system. Our Aluminum Garden Edge System, we call Link Edge, is not only made from the perfect material for the garden but is also very versatile in other ways. Being aluminium, the Link Edge garden edging system is able to be powder coated in a variety of colours. We currently have ten different colours available. Our garden and lawn edging can be used for long straight; curved edges. Even an S-shaped design is no problem thanks to the linking system built into Link Edge. We even manufacture circles and squares for that perfect looking tree or shrub edge and corner connectors for when you have a right angle. All of this can be done on a flat surface or a slope, on hard or soft ground and is available in a variety of heights. How Does Link Edge Work? 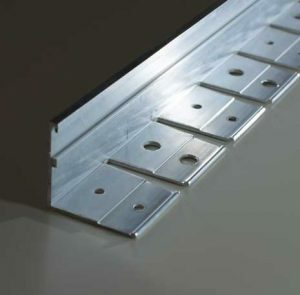 The Link Edge system uses lengths of aluminium that can be joined together with connectors to form a seamless edge around your garden or lawns. Link edge can be flexed into whatever shape you desire or left as a straight piece for that perfectly straight line. If you want a right angle, then use a corner connector and you have it. The holes in the bottom are for spikes which when hammered into place, keep your edging in place. There is a Heavy Duty Link Edge as well. This is for high traffic areas or very hard surfaces. The heavy-duty Link Edge has more holes for additional spikes. It also has smaller holes for Ramset pins to attach the edging to concrete or other hard surfaces. You can also add an additional spike guard to enhance upright rigidity if needed. We provide step by step installation instructions that make it easy for you to install our Aluminum Garden Edge System, Link Edge. Repeat until all lengths are in place. If not in the correct position, remove spikes and reposition. Once you’re happy with how it looks, finish fixing in place and fill both sides with your chosen surfaces. Have a look at our Garden Edging Ideas page to give you inspiration and see how the finished product can look. Are you looking for that perfect garden edging idea? Well, look no further! Link Edge’s Metal Garden Edging solution is what you are looking for. It’s easy to install, provides nice clean looking edges, will not rust and is affordable! Metal Garden Edging provides neat, clean and defined lines right where you want them. Unlike plastic, wood, rock or cement, Metal Garden Edging does not corrode, discolour, fade, break down and splinter, crack, rot or fall apart. Beware though that not all metal is the same. Steel will rust, end up with sharp edges or create other safety issues. However, Aluminium doesn’t do any of these things. Aluminium is the best choice for Metal Garden Edging. It doesn’t rust, fade or develop sharp edges. It is easy to bend to the shape you desire and our Link Edge product has curved edges for safety. Link Edge is a Metal Garden Edging solution that uses aluminium lengths that can be left straight, bent to shape or on a certain angle, joined together to form a seamless appearance and can be used on any slope or flat surface. With a variety of options to choose from depending on the use, surface you’re connecting too or height of the edge you want, Link Edge is the perfect solution for all garden edging. Connect your lengths together if you have more than one and continue to half-hammer in the spikes on the next length. Repeat this step until all lengths are in position. Ensure all the Link Edge pieces ore in the position/s you desire. If not, remove the spikes and reposition. If so, finish hammering in the spikes and fill both sides of the Link Edge with the surfaces you have chosen. There are three main choices in the LinkEdge metal garden edging range; Original, Heavy Duty and Low. Original Metal Garden Edging is available in two lengths, 2m and 3m and four height profiles, 40mm, 50mm, 75mm and 100mm. Original Link Edge suits the majority of edging jobs that you would want to use it for. Heavy Duty Metal Garden Edging is only available in 3m lengths with 50mm, 75mm or 100mm height profiles. It is designed to be used in heavier compaction and high-traffic areas. There are two series of holes running through the length, one is for the Link Edge spikes and the other is for other fasteners like Ramset pins for when you need to fix to very hard surfaces. Link Edge Heavy duty is ideal for driveways and carparks. The new range of Low Link Edge is available in 16mm and 20mm height profiles and is ideal for use with permeable paving, tiling, rubber surfaces and other types of low-profile aggregate and shuttering. There are two other products available, square and circle Metal Garden Edging Kits for trees, shrubs or other garden plants that you wish to edge separately. The square Garden Edging kit is available in 500mm x 500mm or 1000mm x 1000mm and the circle kit in 630mm or 950mm diameter. Both metal edging kits come in 75mm height profile with other heights available on request (40mm, 50mm and 100mm). All Link Edge Metal Garden Edging products are available in a range of Dulux® Customcolour™ powder coating colours. Surcharges apply. See how you can use LinkEdge’s metal garden edging system to beautify and organise your garden.